Upon launching the operational model in Microsoft Excel, the user is automatically taken to the first page of the user form, which prompts the user to indicate whether he intends to examine the impacts of mitigating barriers to clinical trials, or go directly to the examination of clinical trial costs (see Figure C - 1). If “Barrier Impacts” is selected, the user is taken to a screen where different types of barrier mitigation strategies may be selected (see Figure C - 2and Section 5 for further detail). If the user selects “Costs,” the user is then taken to a page that provides a set of instructions and prompts the user to specify the type of clinical trial he would like to model (see Figure C - 3). The clinical trial options built into the model based on data availability include: Therapeutic Area, Devices and Diagnostics, and Pharmacokinetics. If the user selects the “Therapeutic Area” option, a specific therapeutic area must then be chosen from among the following in a separate drop-down menu: Anti-Infective, Cardiovascular, Central Nervous System, Dermatology, Endocrine, Gastrointestinal, Genitourinary System, Hematology, Immunomodulation, Oncology, Ophthalmology, Pain and Anesthesia, and Respiratory System. Once these selections have been made, the user may click on a “Next” button to proceed to the next page of the user form. On the succeeding page of the user form (see Figure C - 4), the user then needs to enter some general information about the trial, including the discount rate to be used as well as the probability of success in Phases 1 through 3 and the NDA/BLA review phase. The user may choose to leave these fields blank or specify that the default values be used, in which case these fields are populated with the values from the interviews and literature, as described below. Also on this page are spaces for the user to select the number of trials within each phase. Due to the need to test different dosages or alter other aspects of a trial, multiple trials within a given phase are common or even required in many cases. Therefore, the user must specify how many trials they would like to have in each phase, with possibilities ranging from one to ten for Phases 1 through 3 and zero to three for Phase 4 (if there is no Phase 4, the user needs to enter zero for the number of Phase 4 trials). 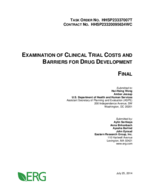 The ranges for the number of trials for each phase were decided upon based on discussions with the U.S. Department of Health and Human Services (HHS) and the U.S. Food and Drug Administration (FDA) (we asked FDA for an estimate of the number of trials used to support efficacy for NME NDAs and were provided with a range of roughly one to nine trials for Phases 2 and 3). These fields may not be left blank, as the responses will determine how many cost input forms the user will be asked to fill in and how many trial costs are factored into the total phase cost calculations for both the default and custom scenarios. Once this general data are entered, the user may then proceed to the following pages, which request various parameter values for each trial and phase (see Figure C - 5). Within each phase, each trial has its own user input page, and the number of user input pages is equal to the number of trials specified by the user in the previous step. For example, if the user indicates that there would be two Phase 1 trials, the user would see two pages of data to enter for Phase 1. Each of these trial-specific pages asks for information on trial length, number of patients per site, number of sites, and itemized costs, allowing the user to customize values for each trial individually. As on the general tab, the user may choose to populate fields with the default values/averages or enter custom values. For convenience and ease of use, we have added various user-friendly features to the model interface. For example, if the user is uncertain about the meaning of a particular parameter or wants to understand more fully what it includes, he can hover over the name of the parameter with the cursor to see a brief definition and any important instructions for how to enter a custom value for that parameter. For more information, users can refer to a “Parameter Definitions” page that contains more detailed definitions, as well as information on sources and units. Error-checking is another key feature designed to improve the functionality of the tool. If the user enters a number that is inappropriate for a given parameter (e.g., a negative number), an error message will appear alerting the user to change the custom value entered. Some of these rules are strict and will not permit the user to continue to the next page without entering a valid value. For example, the user cannot enter a trial success probability greater than 1 (100%) or a negative number of patients. Other rules simply provide warnings to the user that the value entered might warrant additional consideration. For example, using the variances from Medidata, we calculated reasonable ranges of possible values that fall within three standard deviations of the default mean. If the user enters a number beyond these ranges (e.g., 20,000 patients per site), a warning message appears. However, given the possibility that users may wish to test the effects of outlier or extreme values, the model permits them to disregard this warning and proceed. Figure C - 6 shows the results screen of the clinical trials model developed.